Series devoted to saving treasured heirlooms from the scrapheap. Eric Knowles and his team visit Chatsworth House, where they come face to face with some elegant marble plaques. in your garage, this could be the programme for you. If you decide to sell them at auction, you could be in the money. So follow the fortunes of this bedhead and many more on Restoration Roadshow. We're here at majestic Chatsworth in the heart of the Peak District for today's Restoration Roadshow. It's home to the Cavendish family who have lived at Chatsworth since 1549.
and the present Duke and Duchess now share their splendid house with thousands of visitors. and treasures and everyone's keen to know whether they're worth anything. It's absolutely rotten, so... that's all absolutely had it. Will they be kept in the family? Or if they go to auction, will they make any money? Coming up, how did this late 19th century three-wheeler end up in a Hammersmith rubbish dump? -As you can see it was rather distressed. The rear wheel for example was in rather poor condition. Polyester resin or expensive marble?Fake or real? Ceramics detective Roger Hawkins hunts for clues. And fancy a snooze? Imagine waking up to this! they'll flick at you, almost wink at you as you look at it. Chatsworth is undergoing essential restoration work. and the interior is known as the Chatsworth Masterplan. the little pieces of history arriving through the gates today. grimy objects from the garage, broken 100-year-old china. It looks like they have a really chequered history, doesn't it? And then I'll be able to handle the painting after I've washed my hands. Our Restoration Roadshow experts are happy to roll up their sleeves and get stuck in. Nothing is too much of a challenge or chore. when Phil Crosby rolled up with this very special motor vehicle. as nobody wanted loud engine noises to scare the horses. Well, it's the only one you'll find anywhere in the world. -It started life in Paris in 1899. It was found on a rubbish dump in Hammersmith in the mid-1930s by the present owner's grandfather. and he was also an aeronautical and automobile engineer. So with his expertise he was able to rebuild it. I've got some photographs or copies of photographs which show you the condition as found. -As you can see, it was rather distressed. The rear wheel for example is in rather poor condition. But is it a motorbike or a motor car? and also it's got no reverse to it so only goes in the forwards direction. So is this in running order at the moment? No. It will need a little bit of careful tweaking to get it back into running condition. how on earth do you put a value on it? I mean, I'm not going to go there but you tell me. Somewhere between, I would have thought, £14,000 to £30,000. Phil Crosby runs the museum where the car lives and he's keen to make it roadworthy again. calls for a restoration expert. And we have just the man. Rick Turner's gifted in upholstery and coach trimming. on legendary names like Rolls-Royce, Bentley and Aston Martin. So, Rick, what sort of seat would you recommend on this vehicle? stitched to the shape of the actual seat. It's going to be great, great time to do it. because of the height of the arms. Sympathetic looking for the car as well. What about the money? What about the money? Because leather doesn't come cheap. The leather I've got in mind for this is about £300 for a hide, so that's not cheap. -Yeah, just the hide, yes. so you're looking at about £550 to do that, yes. You don't look too fazed? No. That's more or less within my expectations. and at that price I think a vehicle like this needs it. It certainly does. Any future driver of this little treasure would appreciate a soft seat. It's worth quite a bit, but hard to fix an exact price. Phil thinks it's anything between £14,000 and £30,000. Rick's going to charge £550 to create a brand, spanking new seat to make the vehicle whole again. when it was rescued from that trip but it could be a bumpy ride. to find a leather and style to match this period piece. Now, restoration's rarely straightforward and we're always pushing our experts to the limit. Sometimes it's tricky, it can often be fiddly and occasionally frustrating. it can even cause sleepless nights. hand-crafted and so different to the mass produced items of the time. A true ambassador of the Arts and Craft Movement. Paul, I am so excited about this. There's so much to see, there's such interest there. It's classic Arts and Craft in its carving. Could you tell me something about it and the history? in the end of the 1800, early 1900s. He was predominantly an artist in oil paintings, landscapes and things. But he also tried his hand at carving. of the Sheffield Society of Artists in 1907. -I've got a photograph if you're interested. -I'd love to see it. -Have a look at that. -And there's also a wardrobe that goes with it. and you only get that from the best cut oak. So, Tim, we're relying on you to reawaken this beauty. it looks like your dream job. I wouldn't do anything to the panels. I think the painted panels are lovely as they are. And I think we need to be very careful not to over-clean it or over-restore it. a very gentle clean and wax polish, these panels are just going to sing. that sort of work is round about the £400 mark, I'd have thought. Paul paid nothing for it and in its current state I think it's worth around £900. Tim's going to charge £400 to bring back the twinkle. Which means at auction I feel it could be worth over £1,200. in our house and neither of my children have room for it either. We'd sooner it went to a good home where it was appreciated. No sleeping on the job, Tim! in a bid to make Paul some money at auction. Coming up, find out if Dr Roger can help an injured 100-year-old doll. And how's Rick coping with recreating that 1890s leather car seat? some of it broken and others just desperate for attention. and very often you can buy something that isn't quite what it seems. Instead of being worth thousands it can be considerably less. Sadly, they never will be worth anything. And Roger Hawkins, our ceramics restorer, is having quite a day today. Over the years his skills have taken him from Hong Kong to America. But it's right here in Derbyshire where we need you now, Roger. car-boot sale a few weeks ago and I'm not sure what they're made of. And what did the seller tell you about them? Did they know anything? No, not really. Just what they wanted for them. -And can I ask what you paid for them? You paid £50 for them? Do you have any idea what they are? I don't know what they are but I did look up the signature on the internet. I think that's the year he died. These must have been his last pieces of work. -because if these were by Lapini, they would be marble. -in the last few years and they're actually polyester resin. which you can get in some marble and you had this solid, flat effect. If this was marble, you would have a series of veining and different colours. And the rough bits allow the dust to gather more. I don't actually think that's dust. Because these are so new that dirt has been put in their purposefully. It's almost as if you can dip them in a Hoover bag and make fake dust unfortunately. it would have a frame that would be much more ornate than this. So, there are various clues. and reproductions about because of their value. Are these something that you thought you might be able to make a profit on? These were things I wanted to keep but my husband doesn't like them. I think you might have to get to the boot fair a bit earlier to find something else! -Thank you for bringing them in anyway. so Pauline's decided she'll be sticking with the plaques and taking them home. but that's not the case for Rick. He's promised to help bring the this rare motor car back to life. but he has no picture or copy to work from. It was too intricate to do on site so he's gone back to his workshop. This is the cushion which is made of a material called ticking. It's a very close-weaved cotton material. We use it because the horse hair doesn't get through it. Rick is using horse hair rather than wool because of its capacity to retain a firm shape. so that's why we've got markings on it to actually tie this into place. I've just sewn up the end of the casing. to get through the tightly-woven cotton fabric. which keep it all in position so it doesn't spread out into clumps. Horse hair is cut from the main and tail. It's easy to collect and can be used in numerous ways. for paint brushes and the bows of musical instruments. It was even used to make hats and wigs. Rick also wanted authentic leather for his seat but it wasn't easy to pin down. otherwise it won't fold properly. because it's got a lot of oil content in it as well. Didn't look as good as this. but this three-wheeler is the oldest vehicle I've ever worked on. There's not many 1899 cars about. Spot on, Rick, and that's precisely why Phil's so keen to conserve this vehicle for his museum. Find out later what he thinks when all is revealed. Back at the Restoration Roadshow, Tim's been working hard on that lovely Arts and Crafts bedhead. It required waxing and some refixing of the oak mouldings to revive the beauty of its original appearance. This one is loose here, as well, so I'll try and prize that one off if I can. he can glue them back into place. But it's easier said than done. but I'm hoping it won't. There's no other way of doing it. I can't pull the nails out - they've been buried beneath the surface. Actually, that has worked well. from the back of it, because you can't glue glue-onto-glue. so we're just going to clean this off with a very sharp chisel. Tim's using a traditional glue that must be heated to the right temperature. Too cool and the glue will be too thick. If the consistency is right, it'll set perfectly. A little bit of pressure. Exactly the right amount of glue because there's no oozing. it's already fixed enough for it not to skid around when I buff it. which is with a little brush here. a shiny border adjacent to the wood, which would not look good at all. bedhead back to life, but what will owner Paul think of it? -Shall we have a look? And will it awaken the bidders' interests at auction? Here on Restoration Roadshow, we're keen to give you as much advice as we can. particularly if the owner is taking the item to auction. -and leave it for the next person to do something to. family heirloom that's looking a bit poorly. It was my mother's doll. As far as I know, she's only ever lived in the wardrobe, in a suitcase. And then when Mum died, she came and lived in my wardrobe, in a suitcase. We don't know how the damage was caused. I remember back in the 70s, Mum saying that the doll had got a crack in its face. But how that happened I don't know, because it was still in the suitcase. and Germany was the doll-making capital of the world. This little lady was made by Armand Marseille in his large porcelain factory in Koppelsdorf. which was then decorated to achieve a more realistic skin tone. What a shame she's had a bang on the head. Do you have any idea what its value would have been if it were perfect? -Well, I think probably about £250. -Although perhaps in this condition, very, very little, sadly. the amount of damage, it's quite an expensive process in restoring this. my work, then I have to reassemble the whole thing. And that takes a lot of time. perfect condition, would certainly cost in excess of £300. In other words, more than she's worth. Yes, that's what I suspected. Yes. and takes her home, we're getting to the part of the show I really enjoy. which have been so carefully and painstakingly restored. Remember that lovely Arts and Crafts bedhead brought in by Paul Beat? the wood had become dry-looking and the mouldings had broken off. Tim spent every waking hour painstakingly re-gluing and brushing wax into every nook and cranny. I really do not want to get the wax anywhere near that watercolour. But will he have done enough to impress owner Paul? Wow, you said that restoring it would bring out the colour of the wood but that is amazing. Oh, the shine on it. It's beautiful! but Tim has revived the colour and beauty of the grain. The missing sections of moulding have been reattached. Thomas Peters, Paul's great grandfather, was. And it glows. It's absolutely beautiful. -with these medullary rays and the quarter-sawn oak? just to highlight the focal point of the bedhead. -You've done a marvellous job. -I really, really enjoyed doing it. and I'm pleased to admit that I'm very impressed. will it be enough to stir the buyers into action at auction? Well, what a day it's been here in Derbyshire. I've been privileged to see so many fantastic collectibles. So, it's seen the ravages of time. Roger used gentle diplomacy when presented with those marble plaques. It's dated 1888, but unfortunately they're not. back into dream condition, and as we've just seen, he's done us proud. And this lovely German doll had been in a serious accident. she's going home to rest up for the next 100 years. something warm and comfy for the driver to sit on? and carefully created a replica Victorian car seat. to hand over this individually-crafted seat. Will Phil Crosby be impressed? So I'll show you what it looks like now. To think that... I mean, it just looks the part. It's made exactly as it was. And all the piping as well. Thanks to Rick, the great granny of Phil's collection now looks that little bit more respectable. As I'm sure it would have looked when it was first done in the 1890s. Well, yeah, so it doesn't balloon up. Lets air out. quite a bit of discussion when we've had it on show. But now we've got it complete, I'm sure it'll create far, far more interest. I really am tickled pink with it, actually, to see the quality of finish you've created for us. -Well, it's a lovely vehicle. over in Essex, it's auction time for the bed. We've come to Sworders Fine Art Auctioneers and to their country house sale. There are over 800 items on offer, attracting a lot of interest. Everything that's been restored should be noted in the catalogue. It's really buzzing here and Paul Beat's ready to see his bed go under the hammer. In its original state, it was worth £900. Paul has paid £400 for Tim to repair it and give it a good polish to make it more saleable. that it will easily reach £1,200. So how are you feeling? Nervous and excited at the same time. I start the bidding at £800. Do I take 20 anywhere? 820, 850, 880, 900. Bids in the room. 1,250. And I hope it's going to a good home. I'm sure it will have. I'm just intrigued to know who it is. I really want to know. I want to go and talk to them. I just couldn't resist searching out the new owner. Alan Marks turned out to be the winning bidder, charmed by the character of this unique piece. -I mean, are you going to be sleeping in it? My house is Arts and Crafts, built in 1926. -Somerset Maugham lived there and wrote two stories. All around the house. Very good colonial-type house, all in the Arts and Crafts manner. But will Alan's wife share his enthusiasm for it? Has she seen it? -How do you get away with that? And has she ever said things to you like, "Why on earth have you bought that?" -Oh, a few classic cars. would be very proud to know his work of art has gone to such a good home. and even taking off commissions, he's made a good-looking profit. So have you got that money earmarked for anything in particular? Thomas Peters, when he retired, went on a grand tour of Italy. -And painted in Florence and places like that. We're going to recreate his journey. A little bit, anyway. We're going to go on holiday to Italy and see if we can pick out the pieces, the places that he's painted. Well, what an amazing transformation. Our restorers' skills are really paying off and delivering lots of satisfied customers. So until the next time, it's cheerio from Restoration Roadshow. 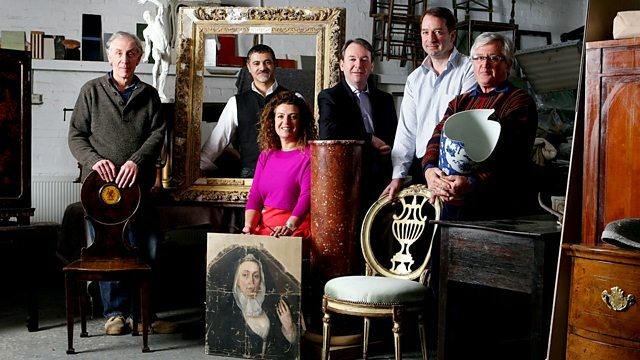 Eric Knowles and his hand-picked team of talented restorers set up base at Chatsworth House. Eric and his ceramics supremo Roger Hawkins come face to face with some elegant marble plaques. But are they all they are cracked up to be? Elsewhere, furniture expert Tim Akers hopes that restoring an extraordinary arts and crafts bedhead will not prove a nightmare. And if that is not enough, a sickly Victorian doll proves a troublesome patient and an eccentric three-wheel vehicle looks ready to give everyone a bumpy ride. But will all the items be restored to their former glory? And will any make it all the way to auction and a lucrative payday?